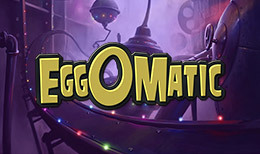 Welcome the Eggomatic factory where the chickens are king of the roost in this online 5 reel slot game. Strive to match varying egg combinations to increase your profits and unlock a range of in-game features including free spin bonuses and prize egg cash rewards to earn your wealth in poultry and become a legend of the coop. A passion for digital entertainment has made NetEnt a leading provider of premium gaming solutions to the world’s most successful online casino operators. A true pioneer in driving the market with thrilling games powered by a cutting-edge platform. A talented team, they take pride in delivering flexible digital casino solutions, so their customers can be unique, premium, informed and ahead, all at the same time. The moment you launch EggOMatic you know you are in for a high-end production slot that is totally different. Before you begin, there is a cool, short movie revealing the story behind the play. Egg production is down so rooster has invented the EggOMatic designed to up egg production. You enter a robotic hen type factory that is quite simply visually stunning. Five reels with twenty fixed bet lines and ten bet levels, you can set up EggOMatic to please on each round. NetEnt are leaders in online gaming and EggOMatic and a few reel spins of this slot leaves little doubt they have hit the back of the net again. You are presented with a play console that rises up in sections and coolly clicks into place. So set your bets, starting with 0.20 a spin or a max of 200 a spin and start rolling out those eggs! Roosters invention, the nicely animated egg dispenser sits to the right of the reels. Loaded with various ‘feature' eggs including Spreading Wild Egg, Free Spins Egg, Coin Win Egg, and a Surprise Egg. The eggs are pumped from the dispenser one at a time onto the moving belt atop the reels. They are numbered and on each spin, they move one right to left one reel at a time. If you land a Red Rooster on the same reel an egg sits on the egg drops onto the Rooster, breaks open and your prize is revealed. Spreading Wild Eggs will switch all adjacent and diagonal symbols into more Rooster Wilds and the potential for a big win is created. The Coin Win Egg awards a guaranteed cash prize ranging from a nice 50 coins up to an egg-cellent 2,500 coins! In addition, we have the Free Spins Egg with which you can win between 7 and 50 free spins. During the Free Spin play, the dispenser releases a random egg and the potential is there to grab more free spins! Let's not forget the Surprise Egg, appearing randomly this egg reveals on of the other eggs. The soundtrack is atmospheric, worth of a movie back ground. The occasional electric buzz and steam release from the dispenser carry superb animations. Wins and events see electric currents streak about the reel grid and animate the hens. EggOMatic is easily one of the most enjoyable slots I have come across thus far. Different and engaging, the features are plenty and when luck winks at you, you can score some tidy prizes. I racked up one or two impressive wins in just ten minutes casual play. Options are available and you can tailor music and graphics or sound to suit yourself. Bets are increased in levels and the auto spins and a Max bet button sit either side of the spin button. Click the i button and a cool movie screen unfolds and the game rules and info play out on screen old movie style. What else is there to say... You like high-end slots, enjoy nice wins? Then fire up EggOMatic and get cracking! EggOMatic dares to be different and the result is a delightful, creative slot that any online casino should have on offer. Fun, lively, laced with production value and style, the theme and the graphics come together to make one of the best slots to come from the NetEnt team.